Cruise to the Mediterranean for an indulgent cruise vacation of a lifetime. Experience the definition of serenity as you cruise Italy’s sparkling Riviera, unwind at one of Spain‘s stunning white-sand beaches and uncover ancient history in fortified Maltese cities. Discover the epitome of bliss as you meander the dramatic coastlines of Santorini, the magical cobbled streets of Mykonos and the glittering turquoise waters of Zakynthos. Cruise the jewels of the Mediterranean, including Barcelona, Nice and Palermo on board Royal Caribbean, Norwegian Cruise Line, MSC Cruises and more. Mediterranean cruises depart from a number of ports, including Genoa, Rome (Civitavecchia), Marseilles and Valletta. Plan your dream cruise to the Mediterranean with Dreamlines! The Mediterranean city of Barcelona is the capital of Catalonia and Spain’s second largest city. The sprawling metropolis is renowned for its captivating architecture, charming gothic quarters and the spectacular Sagrada Familia, a Roman Catholic Church masterminded by the great Antoni Gaudi, which has been under construction for more than a century. The cosmopolitan paradise is famous for its picturesque Barceloneta Riviera and the stunning marina. Civitavecchia, itself a charming port city, is for cruise passengers the gateway to Rome. Founded in 753 BC, Rome is a historical and cultural powerhouse renowned for grand piazzas adorned with exquisite fountains, majestic cathedrals draped in dazzling Renaissance frescoes and an astonishing archaeological and cultural heritage. Marseille is a bustling port city located on France’s Provencal Mediterranean coast. France’s second largest city is renowned for its dynamic multiculturalism and rich maritime history, with a wealth of historic landmarks, ancient cathedrals, edgy art museums and cultural scene to discover. The jewel of Marseille is the vibrant Vieux-Port, the city’s old town and harbor, which is adorned with lively bars, charming brasseries, and cute cafes. Piraeus (Athens) is situated in southeastern Greece and is the Mediterranean’s most significant industrial and leisure port. Athens was first inhabited in the 5th century BC and boasts an incredible wealth of ancient landmarks, historic sites, spectacular architecture and grungy street culture. Venice, the Floating City, is situated in Italy’s northeast over the Adriatic Sea. The lagoon city comprises of 118 islands and hundreds of canals, making it one of the most fascinating in the world. Narrow, twisted alleys, historic monuments, marble palaces, charming architecture, hidden squares and the city’s iconic gondolas characterize the unique atmosphere of this extraordinary city. A mild, Mediterranean climate makes Venice a fantastic cruise destination year-round. Livorno is situated on Italy’s northwest Tuscan coast, a short train ride from Pisa or Florence. Known as the Venice of Tuscany for the Venetian canals that wind through the town’s historic quarter, Livorno lures tourists with its beautiful harbor, Renaissance-era fortifications, and delicious local gastronomy. Monte Carlo is nestled between the French Alps and the Mediterranean Sea and is one of the world’s most exclusive cruise destinations. The glittering Mediterranean paradise features a stunning old town rich with lavish casinos, fascinating museums, theatres, art galleries and world-renowned Michelin star restaurants. The city is best-known for hosting the Monaco Grand Prix, which is held each spring. Naples, Italy’s third largest city, is nestled between the Bay of Naples and Mt Vesuvius. A city of contrasts, Naples is rich with archaeological treasures, edgy alternative districts, fresco-filled cathedrals, Michelin starred restaurants, lavish palaces street art murals, and ancient fortresses. The city is best known as the birthplace of pizza and for the ruins of ancient Pompeii and Herculaneum, which were destroyed by Mt Vesuvius in AD 79. Dubrovnik, the ‘Pearl of the Adriatic’, is situated on Croatia’s southern Adriatic coast. The top cruise destination features an enchanting old town where white limestone streets, stunning Baroque architecture and romantic, twisting alleyways await your discovery, all of which are protected by the city’s iconic ancient city walls. Dubrovnik has recently exploded with popularity as the set of King’s Landing in cult series, Game of Thrones. Situated on Spain’s southern coast, Malaga is the jewel of Andalucía’s Costa del Sol. The glittering Mediterranean cruise destination lures visitors year-round with its warm climate, luxury resorts, beautiful beaches. The birthplace of Pablo Picasso and Antonio Banderas, Malaga has an intriguing 2,800-year history, discoverable by the Moorish castles and Roman theatres that adorn the seaside metropolis. Genoa, the capital of Italy’s picturesque Liguria region, is the gateway to the glittering Italian Riviera. The bustling Mediterranean port city is renowned as the birthplace of explorer Christopher Columbus and is riddled with historical wonders and architectural gems. Palma de Mallorca lies on the southern coast of the western Mediterranean island of Mallorca. The beautiful Balearic island lures visitors to its glittering shores year-round with its mild climate, stunning wilderness, picturesque beaches and charming villages. A hugely multicultural city with a complex cultural history, Mallorca is popular party island with a number of resorts catering to English, Russian, German and Italian tourists. Mediterranean Cruise Destinations: Where to go in the Mediterranean? When choosing your Mediterranean cruise, you'll have to decide if you want to see the Western Mediterranean, the Eastern Mediterranean, or both. The Western Mediterranean is full of cultural landmarks and iconic cities like Barcelona, Florence, and Rome, and is a great choice for people who like exploring other cultures and learning about history. 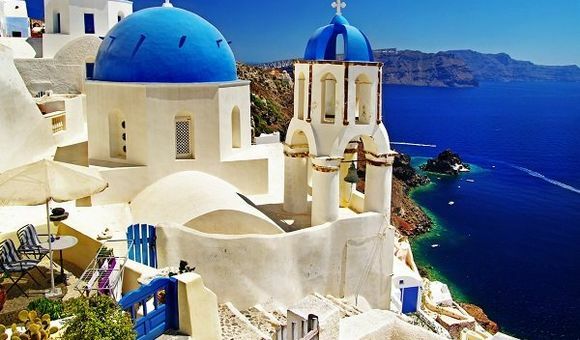 Eastern Mediterranean cruises visit some of the best beaches and most beautiful islands in Croatia and Greece, including Dubrovnik, Athens, and Santorini. Although there are Mediterranean cruises departing from nearly all Mediterranean cruise ports, you'll probably want to sail from a major city such as Barcelona, Athens, or Rome. These cities will be easier to reach via flight, plus they're great choices for an extended stay as a pre- or post-cruise package. Your Dreamlines cruise expert can assist you with booking flights, or you can browse our cruise and flight packages. For a truly authentic experience on your Mediterranean cruise, sail with a European cruise line such as MSC or Costa Cruises. You'll be immersed in European culture from the moment you step onboard, from the ship's design to the cuisine onboard to the passengers you'll meet. For a more typical cruise experience, most mainstream American cruise lines also sail the Mediterranean, including Royal Caribbean, Celebrity Cruises, and Holland America Line. Summer is high season in the Mediterranean, and you'll find the best selection of Mediterranean cruises departing between May and September. For sightseeing and travel, spring is the best time to visit the Mediterranean. The weather will be warm but not hot, and the crowds will be thinner than in July and August. If you're more interested in spending time at the beach, go in late summer to avoid the crowds. September can be an excellent time for a Mediterranean beach vacation, because even once the air temperature has cooled off a bit, the water is still warm – perfect for swimming. Our cruise experts can help advise you on the best time to cruise the Mediterranean based on your interests and preferences. Book your Mediterranean cruise online via our website, or call our cruise experts at 1-888-403-1425. We can help you take advantage of the best cruise deals to help you save big on your Mediterranean cruise. Plan your dream cruise to the Mediterranean with Dreamlines today!